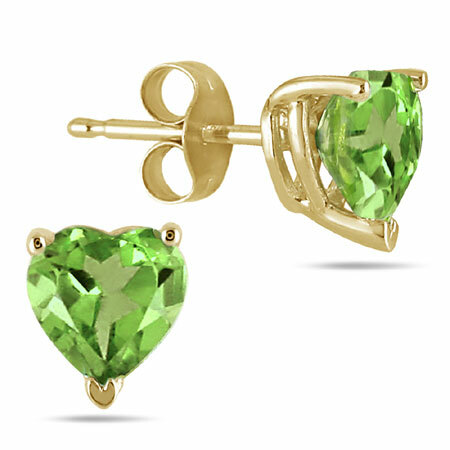 These all natural heart shaped Peridot studs are just what you need to make that amazing fashion statement, which is sure to be heard. The heart shaped stones are an elegant color works very nicely with the 14K Yellow Gold that they were originally crafted with. These two similar colors neutralize any outstanding difference, and set a great tone for any outfit you may have. The stone is a great weight of 6mm, which is a great way to be sure everyone will notice these beauties! The backs of the earrings are secured with a push back which is fantastic in ensuring that these wonderful studs will stay in place, and will prevent any pinching or any uncomfortable feelings. These earrings are the overall perfect choice, and you are on your way to accessory blissfulness. We guarantee our Natural 6mm Heart-Shape Peridot Stud Earrings, 14K Yellow Gold to be high quality, authentic jewelry, as described above.